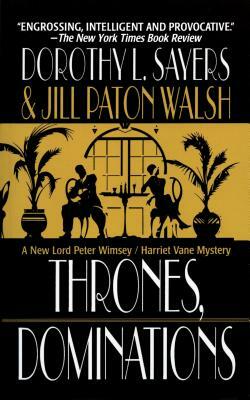 In 1936, Dorothy L. Sayers --considered one of the best mystery writers of the Golden Age--abandoned the last Lord Peter Wimsey detective story. Sixty years later, a copy of the unfinished manuscript was discovered in her agent's safe in London, and award-winning novelist Jill Paton Walsh was commissioned to complete it. The result was the international bestseller "Thrones, Dominations. "Now, this irresistible story is back in paperback. Picking up where Sayers left off, Jill Paton Walsh brings Lord Peter and Harriet Vane brilliantly to life in Sayers' unmistakable voice. "Thrones, Dominations "satisfies the vast readership hungry to know what happened after their honeymoon. Fan and critics rejoice at Jill Paton Walsh's resurrection of this beloved series.